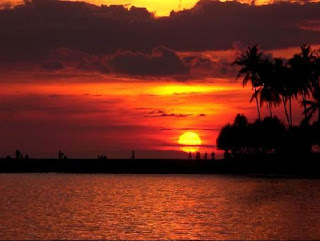 Senggigi Beach is a famous tourist spot in Lombok. Located on the west coast of the island of Lombok. Senggigi beach is not as big as Kuta Beach in Bali, but once we were here will feel like being at Kuta Beach, Bali. Coastal beaches are still beautiful, although there is still littered with garbage because the leaves are still rarely cleaned. Underwater scenery is very beautiful, and tourists can do snorkeling as much because the waves are not too large. Ketengah towering coral reefs causing large waves breaking in the middle. There are also hotels with varying prices, from the expensive to the hotel economically worthwhile. About half an hour by foot, the tourists can find Batu Bolong at this beach. It is a temple built on a reef which is located on the waterfront. According to local legend of yore are often held a virgin sacrifice to the sharks are fed back to this place. Another legend says first of many women who flung himself into the sea from this place because of a broken heart. From this place also seen Mount Agung in Bali.